Steampunk is truely a global phenomenon.Right now it seems to be somewhat concentrated in the US, Canada and Europe west of the Oder River. It happens relatively in infrequently that one finds sites or meets steampunks fro, other places. No, I am absolutely unable to tell you what is being said/narrated/discussed on the respective sites, I neither read nor speak Czech or Russian. I am also only vaguely familiar with the Cyrilic Alpabeth. 16th May 2010: I have just been informed that the artist behind this marvelous image is Vadim Voitekhovich, please check out his site at http://arts.in.ua/artists/woit/. 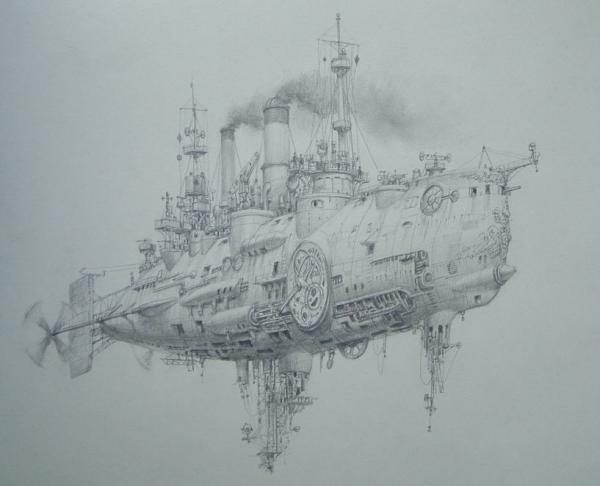 One Response to "Steampunk in the Czech Republic and Russia"